The Best Places to Take Photos in San Francisco! A photographer's guide to San Francisco! Are you traveling to San Francisco soon and looking for the best places to capture some great photos? Need a virtual photography guide? Are you looking for some interesting places there to explore with the camera? Do you love bridges, churches, marinas, architecture and funky spots too? If so, read on because San Francisco has it all! I have traveled to San Francisco many times, and always bring the camera because this town is just such a rich photographic environment. It seems like at every turn there is something new and interesting to photograph. It is a beautiful, wonderful, exciting and photogenic city! I always look forward to my trips there (but hey, who doesn’t?). I don’t claim to be an expert on San Fran, just a big fan of the city and taking shots of the city, so this list (like my Austin list) will surely change over time as I get more familiar with additional parts of this great city. In other words, this list is not exhaustive, it is just a summary of what I have discovered and photographed during my time there. There is just so much there to shoot that there is no way to get it all on a list. Ok, this one is obvious so I wanted to go ahead and get it out of the way. Well, it is the best known landmark as well as an iconic symbol of the city, so you pretty much have to shoot it, right? There are a lot of great spots to shoot it from though, including on the bridge. I also recommend going to Fort Point and shooting it from there. Plus they have these cool old rusty chains hanging around which can add some zest to your image. After that, take the trail which leads up to the bridge as there are some interesting vantage points along the way! Being such a big thing, you can see it from various points in the city so keep that camera handy! The Ferry Building is a beautiful structure and the hotel I stay at in SF is really close, so I always wander over here with the camera after hours. 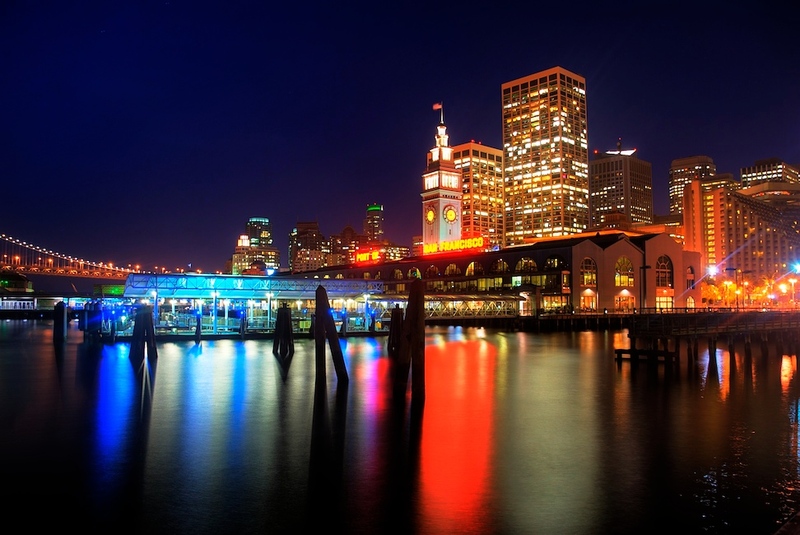 There is a pier off to the side from which you can get a great view of the building, which I recommend doing at night since they light up a big red neon sign on top which says “Port of San Francisco”. How cool is that? The other thing I recommend is that you get inside and take a look around. The ground floor is a Farmer’s Market and has several restaurants and stores too. It’s fun to walk around and check these things out. During business hours, you can also get up to the second floor for a grand view down to the market below, or to just take some shots of the cool architecture! This bridge frequently gets forgotten in all the hub-bub about #1 above, but it is a fabulous bridge and you can get some wonderful shots from a few different spots. I think it holds its own against the Golden Gate Bridge, which is tough to do. The first spot I recommend is along The Embarcadero - just look for those cool pilings poking out of the water, and line it up and shoot! Dusk/twilight/blue hour are great times, since the lights on the bridge are a-twinkling! 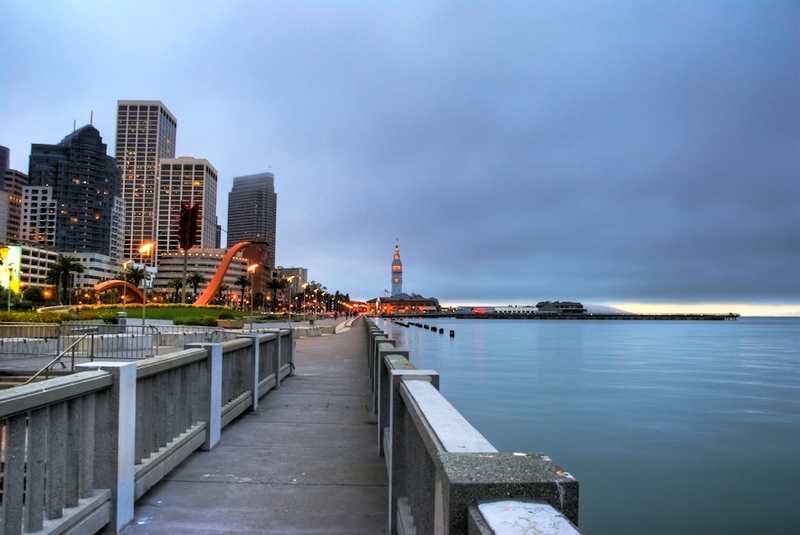 Another good spot is from the pier that sticks out on the left side of The Ferry Building (as you are facing it). If you walk far enough out on that pier you get a nice unobstructed view of the Bay Bridge. 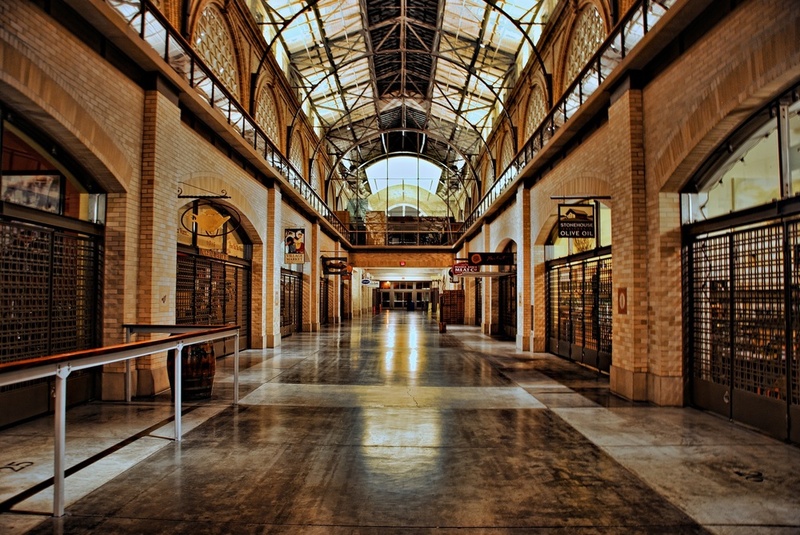 This is the same spot from where you can get a great shot of the Ferry Building in #2 above. Chinatown is fun, interesting and unique. I haven’t spent enough time there but really enjoy it when I do get there. It’s just so interesting. Walk around, go into the shops, poke your head into alleys, and just explore. Oh, and bring the camera. It’s a cool place. What can I say about Grace Cathedral? It is beautiful. It is amazing. It is fabulous. I could go on for a while. The outside reminds me of Notre Dame in Paris somewhat, which is obviously awesome, and the interior is cavernous and wonderful. My first attempt to shoot the interior was thwarted when I arrived on a Sunday morning, and it was crowded. Hello Jim, people go to church on Sunday mornings! So, I came back mid-week and had ample opportunity to photograph it. Plan to stay a while. This entire area is a bit touristy for my taste, but even places like that are fun to explore. There are tons of shops, restaurants and other stuff, an aquarium, boat rides over to Alcatraz and there’s even a nice marina there too. For me though the big attraction is all the sea lions that are lounging on Pier 39, which is sort of next door. There are bunches of them and they lounge around without a care in the world. It’s just another one of those cool things about this town. This place is wonderful and the architecture is stunning. It is a popular place for tourists and of course wedding photographers. There is that wonderful lagoon situated right next to it so you can get some awesome reflections in the water. This hotel sits not far from Union Square and has some cool modern architecture, but for me the big draw is their Grandview Restaurant at the top. The thing is though that you can’t really just walk in and start shooting the wonderful view out of San Fran. Perhaps if you stay in the hotel you could arrange something, but I was just passing through and didn’t even know what I was getting into. I arrived and blue hour was just around the corner, so I was trying to hurry because I wanted the light to be just right. Of course, since this is a restaurant and bar, it was rather busy at that time of day. I came off the elevator, saw the view and got excited, but immediately realized that was going to be tricky. I then spotted a little alcove off to the side of the hostess stand, so I popped over there while I tried to figure out how to set up a tripod in the middle of a crowded restaurant. Luckily, the alcove has nice big windows, as well as sharing in some of that wonderful view - so, bam! I set it up and fired off some shots before anyone really even took notice of me. Who doesn’t like a little chocolate? I know I enjoy it. There are some great shots you can get in this area, including one of Ghirardelli Square lit up at night (I got lucky with the rain stopping before I got there!). But you also have a nice view of the bay from here, and of course the Ghirardelli sign is pretty famous, so be sure and check that out! It's a good one to stop at and refuel all those sugars you depleted from all that walking and carrying camera gear! Isn't it magical when it's blue hour and the rain leaves a nice glossy sheen on everything? I really enjoyed walking around this area, which is populated with a LOT of Italian restaurants. As you probably know, I love to shoot cafes and street scenes in HDR, and this area is a total feast for that sort of thing! North Beach sits basically on the northern end of Chinatown, so assuming you go there it’s easy to just continue the photo hunt in this area. While you are in North Beach, you can easily squeeze in a visit here. This is the bookstore made famous by the Beat Poets back in the ‘50s – Jack Kerouac, Allen Ginsburg, and William S Burroughs. It’s pretty interesting and well worth a stop. There is even a Poets Room upstairs. This pier is just cool. I love the lines here, and standing on the pier gives a great view of the bay (facing away from the city) and when you turn around you are greeted with a cool view of the city and the TransAmerica building. It’s hard to miss this iconic symbol of San Francisco, in fact you really can’t. It juts into the sky and is visible from lots of spots around town. It’s situated sort of on the edge of the Financial District and towers over the surrounding area. As the name implies, this little café is at Pier 23. It's along the Embarcadero, not too far from Fisherman's Wharf. Not a big deal really, but I love little spots with cool signs, so why not shoot it since you might just walk by? Everyone knows about this place, and it’s well worth a visit. You have to buy a ticket for a tour, and though I did that years ago, it was way before I was a photographer. So, I took this shot from the end of the pier at Fisherman’s Wharf – still a cool view, but if you have time (I haven’t lately!) get out on the island for a closer inspection! A cool tower with a strange name, it’s over sort of near North Beach and is another easy to spot and photograph locale. I recommend walking up the hill towards the base of the tower for a great view of town, and a close-up view of the tower itself. In a city surround by ocean, you know there has to be a good beach nearby for some photo work. Well, Baker Beach is definitely a great place to go, and the view of the Golden Gate Bridge is awesome, if the fog doesn't get it in the way! This is a way cool sculpture which is down along the Embarcadero, near the Ferry Building and the Bay Bridge. It's quite large, and just another one of those unique things that SFO has to offer. This is another iconic spot in a town full of them. These Victorian-era row houses sit perfectly on a hillside which gives you a nice skyline view behind them. Everyone takes this shot, and you should too! Ok, I admit that I hate shopping, but I love shooting and though this is a shopping arcade, it’s very photogenic. Being a fan of architecture, it’s hard for me to resist spots like this one. It’s just off Market Street, near the intersection with Montgomery St. When I first came across this fountain a few years ago, it took me a while to figure out what it was. I came at it from a strange angle I guess, but eventually I got around to the front and saw the water coming out. It's right in front of the Ferry Building so an easy grab while you are there! I imagine if you have young kids, you are likely to end up here. I haven’t been inside, but as I walked by I just couldn’t resist the combination of the hard architectural edges with the bay in the background. This is situated on Piers 15-17, just a short stroll from Pier 7. With all my travels to various cities, I’ve developed an appetite for all sorts of architectural shots, from historic sites and churches to modern masterpieces…and everything in between. The Embarcadero Center sits just across the street from the Ferry Building, at the bottom of Market Street, and offers some cool and unique photo opportunities, especially if you can get there early in the morning before the crowds (which I recommend for just about everywhere). So that's it for now! As I visit more spots and get more photos to share, I will update this list. Please leave any suggestions or comments below, and thanks for stopping by!